Like the Dewey’s that was part of a historic LGBT demonstration in 1965, this Dewey’s was part of a chain of hamburger restaurants in the greater Philadelphia area. The first Dewey’s opened in the mid-1930s in Atlantic City, and the chain, originally owned by Louis Yesner, eventually grew to fifteen restaurants. 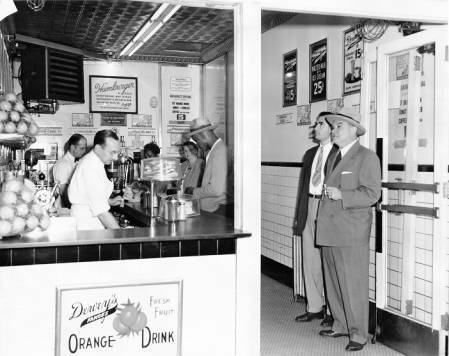 This photograph from the early 1950s shows Philadelphia’s first Dewey’s restaurant, located at 1301 ½ Market Street. 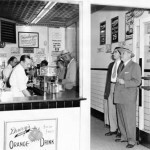 Although some of the Dewey’s locations had dining tables, most were small lunch counters like the one shown here. In 1965, the Seventeenth Street Dewey’s lunch counter became the site of the first known LGBT protest in Philadelphia. The Dewey’s restaurant at 208 S. Thirteenth Street, although not the site of the historic LGBT sit-in, was also an important gathering place for LGBT people in the 1960s. Not only was it open all night, but this Dewey’s was also one of the few free-standing restaurants with indoor seating. Its location close the bars and clubs along Chancellor, Camac, and Thirteenth Streets made this Dewey’s the perfect late-night hangout, attracting a broad spectrum of patrons, including LGBT people. 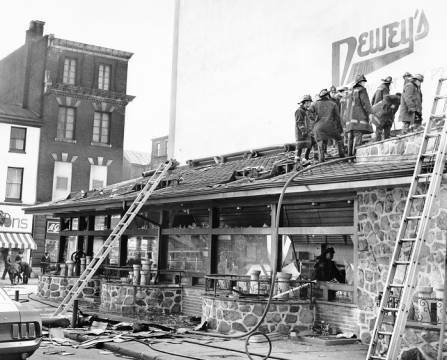 In 1969, the Thirteenth Street Dewey’s was completely remodeled after a fire. 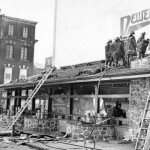 In this photograph, Philadelphia firefighters investigate the extent of the damage. Rittenhouse Square has been a meeting place for "queers" at least since the 1930s. In the 1950s and 1960s, the square was known as a place where gay men and lesbians coming into the city could meet others who would introduce them to the extensive urban homosexual "underground." On April 25, 1965, the Dewey's restaurant near Rittenhouse Square became the site of the city's first gay rights sit-in. In 1972, Philadelphia's first gay pride parades began with a rally in Rittenhouse Square. In response to a disruptive crowd of gender-variant teenagers at the Dewey’s restaurant at 219 S. Seventeenth Street, management instructed staff to refuse them service. Employees interpreted this instruction widely, refusing service to customers who appeared to be gay or lesbian, or who otherwise challenged accepted gender conventions. Drawing directly from the political strategy used effectively by the African American civil rights movement of the early 1960s, more than 150 black, white, lesbian, gay, and transgendered protesters staged a sit-in. Four people were arrested on charges of disorderly conduct, including three teens and Clark Polak, the president of a local gay and lesbian rights organization. 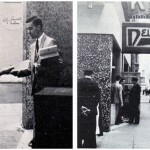 Following the arrests, the Janus Society, a local gay and lesbian rights organization, demonstrated outside this Dewey’s location, distributing 1,500 leaflets over the course of five days (left). On May 2, 1965, another small sit-in took place. Although the police were called, no arrests were made (right). In the May issue of Drum, a monthly magazine published by the Janus Society, Polak stated, “It was a far cry from the previous Sunday . . . I was quite politely told that we could stay in there as long as we wanted as the police had no authority to ask us to leave.” In the wake of the protest, Dewey’s discontinued its policy of denying service to those who appeared homosexual. Although the Dewey’s sit-in did not generate national media coverage in 1965, later historians recognized it as an important event in the history of LGBT activism. Gender-variant activists—effeminate men, masculine women, and people who would probably identify as genderqueer or transgender in a later era—played a significant role in later confrontations as well. 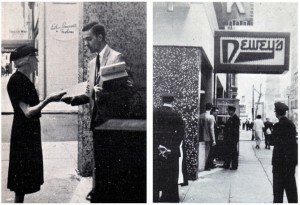 An incident similar to Dewey’s took place in San Francisco in August 1966 at Compton’s Cafeteria, and in 1969, many of the major agitators behind the Stonewall Uprising were crossdressers (a word common at the time) and others who had little to lose because of their unconventional gender identity and expression. Within the gay and lesbian rights movement, the Seventeenth Street Dewey’s sit-in occurred during a season of direct action in support of the rights of homosexuals. 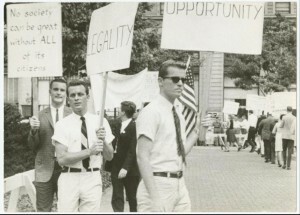 In 1965, Philadelphia activists collaborated with groups in Washington, D.C., and New York to stage a march for gay rights in front of Independence Hall on the Fourth of July. Organizers of the event enforced a strict dress code, as reflected in this photograph. Similar demonstrations were held every year for the next four years. The picketing—and the picketers—became known as “annual reminders.” On July 4, 2015, the Annual Reminder Day demonstration was reenacted as part of a fiftieth anniversary celebration. 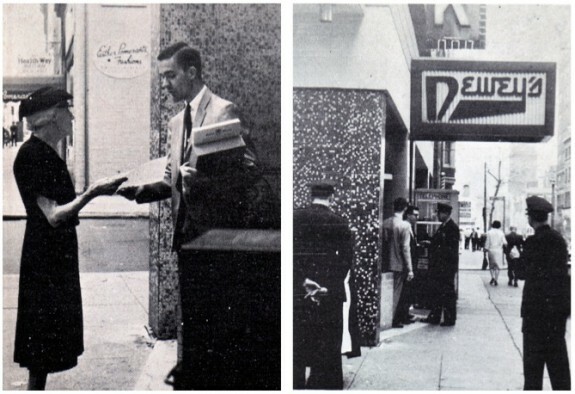 In 1965, protesters at a Dewey’s restaurant lunch counter in Center City Philadelphia demanded access to public accommodations for lesbian, gay, bisexual, and transgender (LGBT) people. It was the first known protest of its kind in Philadelphia, and one of the earliest such demonstrations in the United States. Dewey’s was a chain of hamburger restaurants in the greater Philadelphia area. 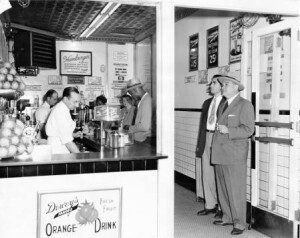 The first Dewey’s opened in the mid-1930s in Atlantic City, and the chain, originally owned by Louis Yesner (1894-1979), eventually grew to fifteen restaurants. Two of these locations—one at 208 S. Thirteenth Street and one at 219 S. Seventeenth Street in Philadelphia—became gathering places for LGBT people in the 1960s. The sit-in took place at the Seventeenth Street Dewey’s. In response to a disruptive crowd of gender-variant teenagers, Dewey’s management instructed staff to refuse them service. Employees interpreted this instruction widely, refusing service to any customers who appeared to be gay or lesbian, or who otherwise challenged accepted gender conventions. The teenagers joined forces with the Janus Society, a local gay and lesbian rights organization, to protest this policy. On April 25, 1965, 150 people were refused service at the Seventeenth Street Dewey’s. Three teenagers and Clark Polak (1937-1980), president of the Janus Society, were arrested and found guilty of disorderly conduct. After the arrests, the Janus Society demonstrated outside of this Dewey’s location, distributing 1,500 leaflets over the course of five days. On May 2, 1965, another small sit-in took place. Though police were present, there were no arrests, and subsequently Dewey’s discontinued its policy of denying service to those who appeared homosexual. The Dewey’s protest was both part of larger historical trends and the start of something new. It took place during an era of grassroots activism, political protests, and urban unrest. 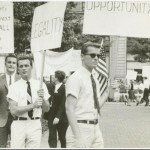 Many participants in the burgeoning gay and lesbian movement were involved in other 1960s political efforts as well, and the particular format of the Dewey’s protest—the sit-in—drew directly from a political strategy made famous by the African American civil rights movement of the early 1960s. Within the gay and lesbian rights movement, this incident occurred during a season of direct action in support of the rights of homosexuals. On the east coast, between April and June 1965, demonstrations of varying kinds occurred in Washington, New York, and Philadelphia. And on Independence Day 1965, activists from throughout the mid-Atlantic picketed in Philadelphia at the Liberty Bell, demanding fairer treatment for gays and lesbians. These protests, known as the “annual reminders,” occurred every Fourth of July for five years. In many ways, the Dewey’s sit-in exemplified political trends of the mid-1960s. Yet, it also represented the beginning of a more radical approach to LGBT activism, which became more fully realized in the years immediately following the 1969 Stonewall Uprising in New York. In contrast to earlier LGBT activism, which sought access to legal protection and freedom from harassment and discrimination, by the late 1960s some LGBT activists were beginning to challenge the very structure of society. People who did not conform to established gender roles—many of them still teenagers—were at the forefront of this shift. Dewey’s was possibly the first action where an established gay rights organization explicitly defended the rights of people to defy gender conventions and still be treated with dignity. 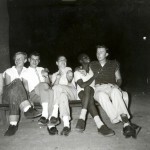 Although the Dewey’s sit-in did not generate national media coverage in 1965, later historians recognized it as an important event in the history of LGBT activism. Susan Ferentinos is a public history researcher, writer, and consultant specializing in project management and using the past to build community. She holds a Ph.D. in U.S. history from Indiana University and is the author of Interpreting LGBT History at Museums and Historic Sites (Rowman & Littlefield, 2015). Bullough, Vern L, ed. Before Stonewall: Activists for Gay and Lesbian Rights in Historical Context. New York: Harrington Park Press, 2002. Skiba, Bob. “Dewey’s Famous.” Philadelphia Gayborhood Guru (Blog), January 28, 2013. Stein, Marc. City of Sisterly and Brotherly Loves: Lesbian and Gay Philadelphia, 1945-1972. Philadelphia: Temple University Press, 2004. ———. Rethinking the Gay and Lesbian Movement. New York: Routledge, 2012. Stryker, Susan. Transgender History. Berkeley: Seal Press, 2008. John J. Wilcox Jr. LGBT Archives, William Way LGBT Community Center, 1315 Spruce Street, Philadelphia. Barbara Gittings and Kay Tobin Lahusen Gay History Papers and Photographs, New York Public Library, Fifth Avenue at Forty-Second Street, New York, N.Y.
Janus Society Records, ONE National Gay and Lesbian Archives, Los Angeles, Calif.
Site of Dewey’s Lunch Counter Sit-In, 219 S. Seventeenth Street, Philadelphia. Gay Rights Demonstrations historic marker, Sixth and Chestnut Streets, Philadelphia. William Way LGBT Community Center, 1315 Spruce Street, Philadelphia. Some day , I will read where a museum has FINALLY had the courage to assemble a NATIONAL history of achievements we Transgender people have given to the entire population of America. The Neanderthals will set up a permanent boycott because they are the ones UNWILLING to accept the US is a FAR BETTER place because of our contributions.